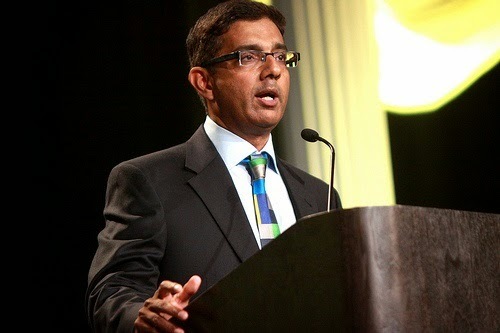 Immigrant and conservative filmmaker Dinesh D’Souza has deep affection for the USA. 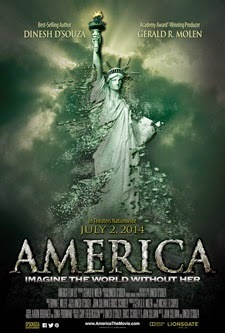 And in his new movie, America: Imagine a World without Her, presents good reasons for it. Still, it’s an uphill climb to get the message across. Based on his wildly popular book of the same name, D’Souza solidly identifies the claims against America in war, capitalism, and racism and debunks the heck out of them. As we see Washington get shot on the battlefield of the revolutionary war in a spooky alternative universe, the question emerges: what would the world be like without America. He first interviews and presents the attackers rather frightening case, making many patriots in the audience nervous, before taking a step back and examining the validity of their arguments in greater detail. Communists and leftists such as Noam Chomsky, Michael Eric Dyson, Saul Alinsky followers and Ward Churchill and further prominent activists are interviewed. Sen. Rand Paul, Sen. Ted Cruz, and many notable others in academia then take on their arguments, reducing them to pulpy orange juice. Via TV clips, Megyn Kelly, Sean Hannity, and bomb-happy Bill Ayers also make appearances. D’Souza made a name for himself when he made the film 2016: Obama’s America. It became the second highest grossing political documentary after Michael Moore’s Fahrenheit 9/11. Impressively, his new endeavor has become the seventh-highest grossing political documentary, joining a list of predominantly liberal films. Yet critics that bowed their heads in reverence to Moore, condemned D’Souza’s film. RogerEbert.com claimed that “it plods along with all the verve of a PowerPoint presentation”, calling it the historical recreations “cheesy” and the interviews “over edited”. Jim Gaines of Reuters went so far as to tell people to even go see the film. It’s no wonder its Rotten Tomatoes approval rating is around 9%. Critics were indeed swift to dismiss the film, but actual audiences housed very different opinions. According to Metacritic, a well-regarded website which ranks audiences approval of the films, the film comes in as an A+. Few films receive an A+ on Metacritic, making America one of the highest ranked movie events of the year. It is also the highest grossing documentary of the year so far. So much for the reliability of the mainstream, albeit liberal, press. In addressing these critics concerns, I will start with the allegation that it’s a mere PowerPoint presentation. It used bullet points to list the concerns some folks store of America. If that’s a little PowerPointy, so what? It made things nonetheless fascinating. Plus, it’s a documentary. What do you expect, ballet? Tinkerbell? The historical recreations served their purpose as powerful, realistic bits of filmmaking and to say that they were cheesy is voicing one's mere disdain for a good history lesson made interesting with music and effects. In context, the left has never much approved of actual history lessons. If they did, this film would never have had to be made. First RogerEbert.com implies boredom through a hideous high-schoolish image of a sluggish, pretentious PowerPoint presentation, then they condemn the film for being powerfully cinematic. If you want to see a longer, uncut interview or debate, switch on your TV or attend a Ford Hall Forum event. This is a movie. The filmmaker’s job is to present a good product interestingly and economically. The editing accomplished just that. It was a job well done. On another note, I may be mistaken, but the craft of a mainstream critic to give his personal, expert analysis on what makes a film strong or weak, providing the reader insight on what might or might not be good to see. The critic does not act as a century guard commanding people to see or not see a film. Producer Gerald Molen (Schindler's List) said he had never before encountered anything like a critic such as Gaines heeding moviegoers to isolate the film. Gaines perhaps should be reminded that he is far from a traffic light, commanding viewers not to see one film or the other, but a source of reference for judgment. Largely excellent arguments crafted by D'Souza make the film one of the most informative documentaries around. I do agree with one reviewer that a bit more confrontation and debating between the two sides and their arguments would have been nice. But again, a filmmaker does have to be economical though and some perfectly good movies--a few of the Harry Potter films—have been attacked for being too long. Again, keeping things economical is important, as any professional filmmaker will tell you. Upon dealing with the allegations, the film deals with whose propping up these ludicrous statements regarding anti-American exceptionalism. It deals with the leftist agenda, used by President Obama and former Secretary of State Hilary Clinton, and its gradual plan to downturn America. The information revealed is startling and perhaps somewhat terrifying. Those who are open to an alternate picture of America and who begin to lodge a deep understanding of the USA will certainly tear up at the end when the puzzle comes together and we step back to cast our glance upon a most ugly image. Tears of happiness, however, flood the theatre upon the ending rendition of the American anthem. In the film, D’Souza does go over his conviction for violation of (rather idiotic) campaign finance laws and openly, humbly declares his mistake. A far cry from a certain gentleman in the White House, he does lay his cards on the table. Cinematically, the film was visually stunning, engaging, and adhered to a high standard of storytelling as any good film should. It's an intellectual thriller. With the producers of Schindler’s List and Jurassic Park backing it, and the highest quality of documentary filmmaking, this conservative film represents a prestigious tier of filmmaking in a predominantly leftist field. Despite unearned bashing from critics the film has been enormously favorable with audiences and has booted out a Moore film as seventh highest grossing political documentary of all time. A dramatic plea for justice, the film is a worthwhile summer adventure. Book Review-Secret Agent 44: Who Stole Air Force One? A recent children’s spy book, Secret Agent 44: Who Stole Air Force One, from author Dow Kump proves itself a playful, adventurous, and most engaging affair. This relatively unknown author first came to my own attention quite a few years ago when I was wandering the isles of my library's book store. A book with a space shuttle pictured on the front caught my eye. The book itself had been tossed in the corner. Project 00 was luring me to its side. The cover art looked a bit like one of those early/mid-2000s video game. There wasn’t much in the book store then, and after all how bad could a book with a picture of a space shuttle be? As a matter of fact those products are usually the best—anyone remember The Magic School Bus? The book turned out to be an amusing, well-written adventure…and the author's name was inscribed in the front. His new book is more aimed at readers in the second and third grade according to Kump’s website. It shared with his previous book the familiar video game-esque cover art. 12 year old Charlie Richmond dreams of walking in his Dad’s shoes as one of the greatest spies of all time. Richmond trains himself, innovates new gadgetry, and sets his sights on a particular mission to accomplish, only to bungle and make a disappointing slop of it. However, his understanding mother encourages him to pick himself up, dust himself off, and continue to reach relentlessly for his dream. Richmond only finds himself in the middle of further mishaps. When the powerful and undeniably cool Air Force One disappears, Richmond goes after the crooks in charge. The thieves, two dim-witted magicians have obtained a dangerous device that transports any object from one location, plopping them roughly in another. Upon finding the large aircraft, he sets up camp inside the machine and develops an elaborate scheme to thwart the magicians by using wit and gadgetry. His father and his team espionage swingers find Richmond, and the two teams end up battling two evil magicians while the plane is in flight and trying to land it in a football stadium. Kump believes in attaching themes to his books. For Project-00, it was “nothing great happens without determination,” and for Secret Agent 44, it reads “follow you dreams,” according to his website. The book was atypical only in its enduring, somewhat attractive outlandishness, perfect for young children—as well as those who perhaps still wish they were young children. Richmond was decently fleshed out, though his brother was formulaically reminiscent of the elder sibling in his previous book, though I don’t think readers will mind. The writing is clear and solid and formulated for a child’s accessibility. Some children may find the message of the book cheesy and too mushy for their likening. Those youngsters never bother to read anyway. I would commend Kump on his delivering a valuable message; it’s what more books should be engaging in. It’s this, and the author’s magnificent imagination to match a child’s mind that make this book worthwhile. It’s Leave it to Beaver, but with the James Bond/Alex Rider excitement. In short, that adds up to something recognizably Disney-esque. As a matter of fact, it would be a fun candidate for a Disney movie: a fun sibling relationship, two bumbling crooks, excellent message of following your dream, as well as the importance of family, a brave, determined and certainly innovative main character, and a dozen Shirley Temple’s worth of action. The best part might be the sequence when Richmond rains gadgetry and pitfalls onto the crook magicians, almost like something from Home Alone. It’s rather fun to visualize, even for someone who’s past the reading target such as myself. Kump has transcended his imagination with a captivating young read, held at its core by one of the finest messages one can offer the young, determined mind of any age: Follow your dreams! The book can be found online at Amazon or at the author’s website. My recommendation is to obtain the book for your elementary school student. Chances are, it’ll do much for them than anything they’ll read in school. Copyright 2014 by Robert Steven Mack, all rights reserved.